Too often, we set goals that, while lofty and admirable, are way too painful to keep up with. How many times have you promised yourself that you’re going to organize that closet or your garage? How many resolutions have you made to spend less money on fast food and pizza? Another common goal many of us resolve to accomplish every January 1 is to live a healthier lifestyle. Well, you could spend an entire weekend doing online research and find a thousand ways to live a healthier lifestyle. And some of them are pretty painful, right? How excited would you get about something called a brutal 35-minute workout? It’s no secret that regular exercise has tremendous benefits for your health, which in turn makes you feel a lot better emotionally. Everybody knows this, yet very few people actually do it. Why is that? One possible answer is that we perceive exercise as a form of discomfort or even pain. And as human beings, we are wired to avoid pain. The rational, intelligent thinker in each of us knows that exercise will make us feel better and live longer. We also know that, while we’re doing it, exercise can be unpleasant, especially if we haven’t been doing it for a while. So that’s my goal with this post. I want to remove the perception of pain or discomfort from the thought of exercising… by walking. This year, take a day and make it your goal to walk as long as you can without feeling pain or discomfort. Walk at a comfortable pace, but just walk. If you can only walk to the corner and back without feeling pain, do it. Then the next day, do it again. Pretty soon you’ll notice that you’re not feeling that discomfort when you get to the corner. When that happens, cross the street and walk a little further. According to the World Health Organization, all it takes is a half hour of physical activity five times a week to reduce the risk of heart disease and many other conditions. And physical activity is anything that gets you moving. If you’d rather go to a mall and browse through the stores, that counts. It improves your heart health by increasing heart rate and improving your circulation. It lowers your “bad” cholesterol numbers. It doesn’t damage your feet, ankles, knees or hips, even if you do it over a long period of time, like jogging can. The more you walk, the more it improves your stamina and endurance, which is why many people continually increase the distance and speed of their walks. It burns calories. How many calories you burn depends on your weight and the distance and speed you walk, but as an example, a 160-pound person who covers one mile in a half hour will burn about 90 calories. Also, to help you jumpstart your walking program, I’d like to invite you to join me for our weekly Walk With A Doc program, held every Friday. We meet at 11 a.m. at the West Orange Trail – Killarney Station located in Winter Garden and walk along a winding trail that takes you through wooded areas and provides plenty of scenery. For more information, visit our Facebook page. So come on out! I look forward to meeting you and helping you make 2018 a happy, healthy year! We believe that maintaining a healthy lifestyle is the key to living a longer, healthier life. 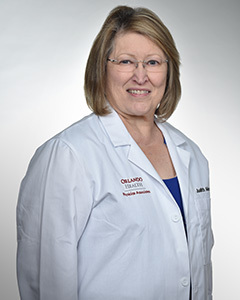 Orlando Health Physicians strive to build a relationship with each patient. Request an appointment with one of our primary care physicians with offices located throughout Central Florida.